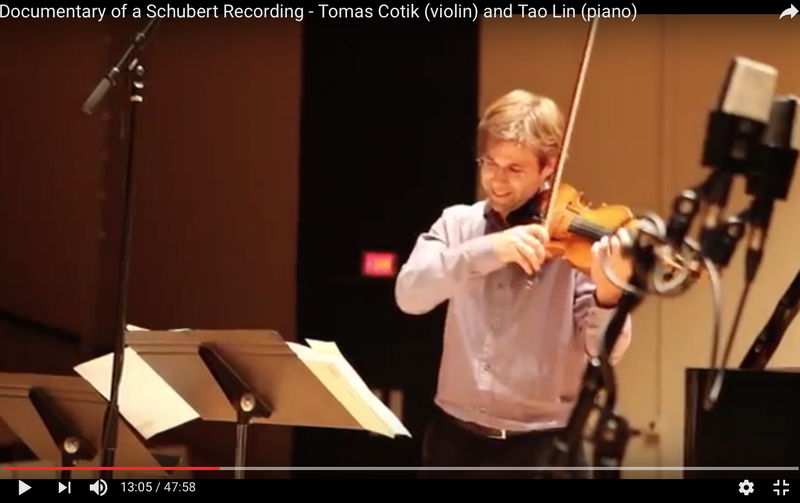 January 19, 2017, 5:24 PM · Recently I made a recording of Schubert’s complete works for violin and piano with pianist Tao Lin, and an important goal in approaching our recording was to make informed decisions and interpretations inspired by knowledge of Schubert’s times. To this end I researched the historical context of each piece in order to know what the usual practices in interpretation were at the time of its composition. At the same time, we recorded with modern instruments and tried to incorporate our own modern esthetical understanding of the pieces into the historical frame. What follows is a synthetic description of certain aspects of this research and our interpretive decisions. For a violinist, one way to approach the style and tonal qualities of original instruments is not to apply too much pressure with the bow. By the time of Franz Schubert, violin bows with the modern shape, introduced by Francois Xavier Tourte, were already in use. At the same time, older “transitional” bow models were also available in Schubert’s time, and it seems that a local bow model was available and preferred in Vienna. Pianists using modern instruments can approximate some of the characteristics of a pianoforte of Schubert’s time by avoiding emphasis on strong dynamics in the outer registers and thereby emulating the weaker outer register of the 5 ½ to 6 octave instrument. Another issue regarding sound is the use of the pedals. In Schubert’s time, the pedals were used not as a standard resource for achieving legato passages or for facilitating technical execution, but rather for subtle special effects. 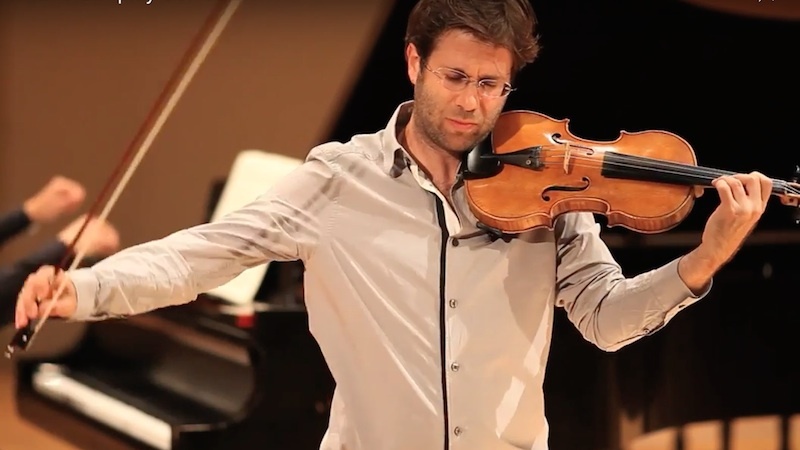 Regarding the use of vibrato on the violin, we know from the treatises about interpretation that some kind of vibrato—with variations, less uniform, and probably not on every single note—was used during Schubert’s time. It is very possible that it was used as an ornamental device and not as a standard continuous addition to the sound. It is more difficult to be certain about the meaning of Schubert’s tempi. While Schubert did not put metronome markings on any of his instrumental works, some conclusions can be drawn from the contemporary metronome markings in some of his Lieder and in the opera “Alfonso und Estrella.” There are signs indicating that many allegro movements, according to Schubert’s choice and the practice of that time in Vienna, were performed faster than what is common in today’s performances. Some of these bright tempi may have been played adequately only by the best players of that time. Some researchers believe that in some cases the written values of complex, simultaneously occurring rhythms could be performed differently from their literal meaning. In most cases it is possible to play the literal written rhythms and, in our opinion, doing so helps to differentiate between voices and to keep the identity and gesture of the motifs. Another topic of debate regarding rhythm is the interpretation of dots and double dots. While over dotting is documented in German Galant style and classic period solo playing, it is not certain that this applies to Schubert’s music. The most salient argument is that Schubert knew how to write double dots and indeed used these markings deliberately in these pieces. Yet another area of our research was tuning. Our recording is made with modern instruments and the modern “standard” pitch. While the Paris Conservatoire had already experimented with the tuning of the A = 440 in 1812, in 1828, the pitch in Schubert’s Vienna appears to have been slightly lower than the standard modern convention (around A = 440). Tuning forks from that time are generally in the region of 425, and a tuning fork that apparently belonged to Mozart, made by the piano builder J.A. Stein, was A = 421.6. There wasn’t a single “standard” in Schubert’s time and even higher tuning of the A can be found. Schubert’s harmonic movements and enharmonic modulations ask for an equal temperament of the piano. Some violinists today also tend to play the leading tone “melodically” giving the line more expressivity but causing some vertical intonation inconsistencies. Schubert received his training in string playing at a time when the classical principle of low sharps and high flats was still valid. In fact, Joseph Joachim (1831-1907), one of the most significant violinists of the 19th century and close collaborator to Johannes Brahms, belonged also to this school. It continues to be a challenging and personal decision to balance vertical and horizontal intonation in a way that is both coherent and expressive. We decided to honor all written repeats in this recording, as we found them to be of great importance to the overall structural form and proportion of the pieces, and there is no historical evidence that implies that any of the repeat signs in Schubert’s music should not be performed. The edition we chose for this recording was Henle, which, in our opinion, offers the most accurate urtext (original text). It has been very interesting to observe in this and other Schubert manuscripts how he appears to have composed by perseverance and hard work rather than through spontaneous inspiration. Another noteworthy interpretational issue is the meaning of long slurs. The few times that the violin has slurs that are too long to be executed properly, they could be interpreted as expressive markings indicating the phrase. Schubert uses a lot of accent marks in his pieces, and these stresses could have different meanings. The accents give us a more detailed idea of how Schubert wanted to phrase his music, and they could also indicate a metrical pattern. An accent mark can also be interpreted as indicating one level of dynamic higher than the context in which it is written. We have to remember that Schubert also writes the signs Fp, FFp and FFFp and sf or sff for stronger dynamic and emphasis levels. In his manuscripts the [>] sign is easily confused with the hairpin, and sometimes we cannot even be sure if there should be a difference between the effects of those. In our opinion, it is not possible to standardize the interpretation of these signs; therefore, we approach them in our recording on a case-by-case basis, considering their musical context. Regarding the interpretation of articulation marks, we considered and followed what most of the treatises of that time indicate. When a note has a dot, the beginning and ending of it should be heard particularly clearly and separated. Strokes may be played particularly short whereas slurs over strokes can mean that notes should be separated but played in a single bow stroke on the violin or a single swing of the hand in the desired direction on the piano. When it comes to trills, we have to remember that Hummel’s treatise, written in 1826 and published in 1828, is considered the first treatise documenting the start of trills on the principal note. Nevertheless, we can imagine that this practice was in vogue before the treatise was written. For example, in the music of Antonio Salieri, Schubert’s teacher, we already have trills beginning on the principal note. In our recording, we assume that all trills without grace notes are to be started from the main note. Another reason for this is the fact that Schubert often did indeed write grace or starter notes before the trills and resolutions when he really intended to have them. The last subject we will address here is the interpretation of appoggiaturas. Generally speaking, a short appoggiatura can be short and on the beat or before the beat and without stress. The appoggiaturas not only give a rhythmic indication, but also can mean a stress and agogic indication. We believe that each appoggiatura should be treated based on the musical context in which it appears. Examining all of these issues gave us a greater understanding of notational and stylistic practice in Schubert’s time and allowed us to re-contextualize and perform his work today with greater authority and creativity. There are many more layers and details to the research and knowledge we gained about these pieces. For further reading on the historical context of the composition of these pieces as well as detailed insights into aspects of our interpretation of Schubert’s music, please refer to the booklet of our recent Schubert CDs (CENTAUR RECORDS 3250 and CENTAUR RECORDS 3374) and to my doctoral dissertation available at www.tomascotik.com. While we took all of this research into consideration in preparing this recording, our approach was ultimately guided by our deep appreciation of this music. Click HERE to watch a documentary on the making of this recording.